Celebrity Cruises reveals Celebrity Edge, featuring the work of A-list global architects and designers, and aimed at discerning global travellers. American designer Nate Berkus serves as Celebrity Edge's design ambassador. The team arrived at designs that are fresh, exciting, current and comfortable – the essence of Celebrity's Modern Luxury style. Inside the Celebrity Edge, the Edge Stateroom with Infinite Veranda turns guest quarters into a seamless space, from the room's door all the way to the water’s edge. The touch of a button gives guests open-air access to the sea, bringing the outside in and the inside out. Guests can take complete control of their stateroom and personalize everything from lighting, shades, temperature and service – even choosing a setting to tuck them in or gently wake them. 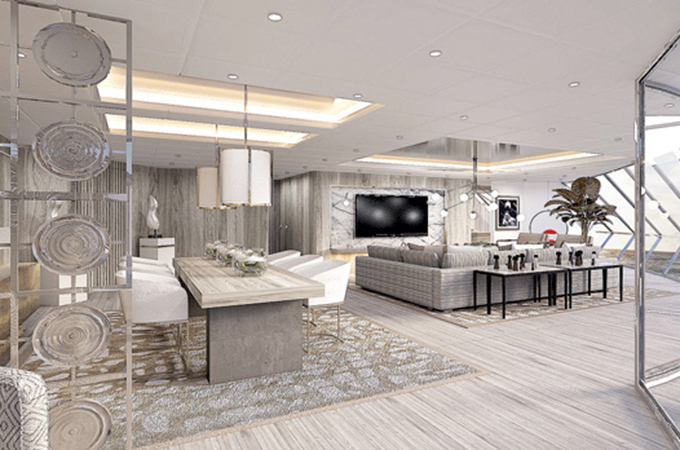 “The 2,918-guest Celebrity Edge is one of the most exciting, innovative and transformational ships I have ever been involved with," says Richard D. Fain, Chairman and CEO, Royal Caribbean Cruises Ltd.
With Celebrity Edge, Celebrity has more than doubled the number of available suites, adding two spectacular new categories. At the top of the line are two new Iconic Suites situated above the ship’s bridge. These near 2,600 sq ft, two-bedroom, two-bathroom suites feature mind-blowing views thanks to panoramic windows enveloping the dining room, living room and bedrooms. The 700 sq ft veranda offers a 270-degree view of the ocean. Cantilevered from the side of the ship, the Magic Carpet makes Celebrity Edge’s distinctive profile recognisable from miles away. The size of a tennis court, this engineering feat scales the 16-deck ship through the day and evening, positioning at four of the ship’s decks, and transforming into a new experience at each one. At the summit of the ship on Deck 16, the Magic Carpet becomes a specialty restaurant offering a special “Dinner on the Edge” for 90 guests.